PART 2 – …who seems to know an awful lot about our fearless private eye. How many times had I heard those famous last words uttered to me by a she-devil in a skirt? My uninvited guest puffed away on her filtered cigarette and gave me the old once over with her eyes, looking at me in much the same way a lion must look at a fat gazelle with a gimpy leg. “Some detective you are!” the lady said as she snapped off her right glove and stretched out a finely manicured hand, complete with red nails polished so brightly I was able to see my mug staring back at me in them. I stared at that dainty hand and silently kicked myself on the inside for letting a clue slip past me. Maybe it was late, maybe it was the extra doses of Jack Daniels, but that gal had gotten one over on yours truly, and I didn’t like it. Alien Jones here, beaming the answers to the great questions of the universe straight to your laptops, cell phones, iPads, Kindle Fires, Samsung Galaxies, and yes, even to you oddballs who still cling to your blackberries, desperately trying to party like it’s 2003. First, let us address the proverbial elephant in the room. Our esteemed Blogger-in-Chief, one Mr. Bookshelf Q. Battler, has been taken captive by the Siberian Yeti, after having his compound overtaken by the same aforementioned ne’er-do-well snow monster. Q. Alien Jones, you are the most badass alien in the universe, a master of all manner of lethal technologies and advanced weaponry. Surely, you can remove a Yeti from Bookshelf Battle HQ. Q. Why are you referring to humans as aliens? You’re the alien. A. To me, you’re the alien. Q. If you have a rule against helping alien civilizations, why are you writing a Q and A column on a book blog with 3.5 readers? Now then. I didn’t receive any questions this week, which is surprising. Not to be rude or anything but to borrow a line from The Simpsons, “what you people don’t know could fill a warehouse.” So, I’ve decided to ask myself a series of questions surrounding a topic that some of you Earth creatures have been wrestling with lately. Q. Alien Jones, should I have my kid vaccinated? A. If your Doctor advises it, then yes. Q. But vaccines cause autism! I’ve heard so many anecdotes about kids getting vaccinated and then becoming autistic. A. Anecdotes aren’t science. Your kid wears diapers. Do diapers cause autism? Your kid breathes air. Does air cause autism? Your kid watches Barney. Do people in purple dinosaur costumes cause autism? Q. But we live in such healthy times compared to the days of long ago. Surely, small pox or measles can’t be that big a deal. A. Picture me slapping my three fingered hand against my cranial dome in disgust, as I realize I know more about your world’s history than you do. In the dark ages, long before vaccinations were invented, various plagues and diseases swept through one country after the next. Every village had a man who would push a cart through the streets just to collect all the corpses. The reason why you don’t see people dropping like flies these days is due in large part to vaccines (the idea of which we aliens beamed into the minds of your most prominent doctors because it made us sad you were all croaking like frogs on a log). 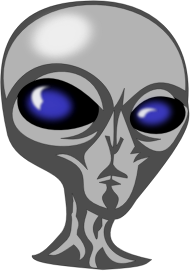 Ultimately, it makes no sense to this alien why humans would put their children at risk for contracting a medieval disease that was put out of commission by medical science long ago. Q. But my doctor’s medical opinion might be that my kid should not be vaccinated. A. That is entirely possible. There are some kids with medical issues where a vaccine could pose a problem. But at least you based the decision not to vaccinate on a medical professional’s advice, and not a comment made by Jenny McCarthy on a day she decided to wear pants. Q. But you can’t prove that vaccines don’t cause autism. A. I can’t prove that you’re not wearing invisible underpants forged from solid gold. Q. And why should I take your word for this? A. You should absolutely not take my word about any of this. In fact, if any crooked lawyers are reading this, be aware that I am a fictional alien that exists in the mind of a blogger, and therefore my word should not be relied upon as medical advice. You should contact a doctor, who will be able to give you a medical opinion as it applies to your individual kid’s situation. Bookshelfbattle.com, its nerdy proprietor, and this Alien Correspondent do not in any way, shape, or form hold anything written on this site as medical advice that should be relied upon. Q. Why do you dislike lawyers? A. Because they are the same people who made a world where a car company that put out an obviously fictional advertisement in which a car is driven on top of a train felt it necessary to add a clause warning people against trying such an obviously ill-advised and impossible endeavor. I’m doing my best not to insult humanity but it’s just that, you know, on my world, we’re able to watch this commercial and already understand that we should not attempt to jump a car onto a train. But I suppose companies must provide ample warnings to assist the simplest of a simple species. Q. If this site is occupied by the Siberian Yeti, how are you posting on it? A. My species invented intergalactic space travel. I’m pretty sure we can get a post onto a blog. Anita Lovett of Anita Lovett and Associates for tweeting a request for the twitosphere to help Bookshelf Q. Battler raise the 4000 follower ransom required to remove bookshelfbattle.com from unjust Yeti occupation. The rest of you were content to allow BQB to waste away as a Yeti hostage. For shame. For shame, I say. Krissy Penner of cricketsareok.com for submitting video proof of alien existence (I could be wrong, but that guy on the left looks like a colleague I met as a cadet in the Intergalactic Exploration Corps). Counterargument – this video may have nothing to do with aliens but rather, is a rap performance. Bookshelf Battle Blog Followers, you might notice that BQB has been promoting some of you through other forms of social media. He has been on a real “pay it forward cosmic karma” kick lately. If you aren’t cool with it, just let him know, but I assume it’s his way of thanking those who aid in his quest to double his readership from 3.5 to a whopping 7 readers. Thank you for your time, 3.5 readers. I must now travel to the planet known as Moikro. I am on a very sensitive diplomatic mission, namely, to convince two separate alien species to stop bogarting each other’s space snacks. They’re about to go to war over who gets to keep the planet’s supply of buffalo wing chip dippers, and my friends, it will not be pretty if diplomacy fails to win the day.